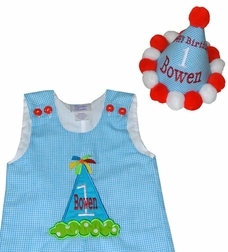 A cute personalized birthday hat outfit for boys available for his 1st, 2nd or 3rd birthday and beyond. Here we make a John John or a longall OR a white cotton shirt and applique it with a colorful birthday hat. The shorts are made with turquoise shorts and the birthday hat is made of turquoise gingham to match the shorts. 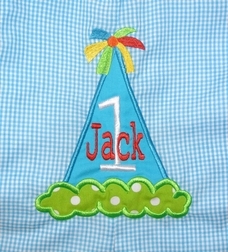 Inside the hat we embroider your little one's birthday number and name in the hat.